Native forests chipped to grow hydroponic tomatoes! This is largely what’s left of a 35 yr old native forest at Tolmie, NE Victoria. VicForests’ claim that only ‘forest residue’, or ‘forest waste’, is sent to the chipper for use as biofuel, is patently false. Chippers are fussy beasts, they consume only straight logs – no bendy, branchy bits for them! And if the log is a little too big for the chipper, it doesn’t head to the sawmill, NO, it’s split on-site so that it will fit in. 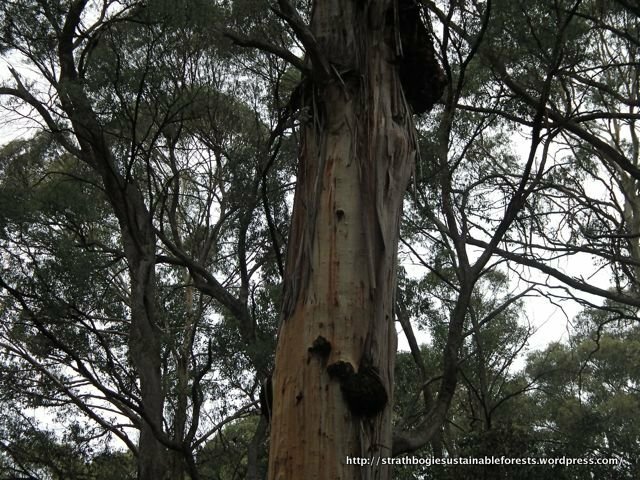 Take a look at these pics, showing a VicForests Tolmie coupe before and after harvest. 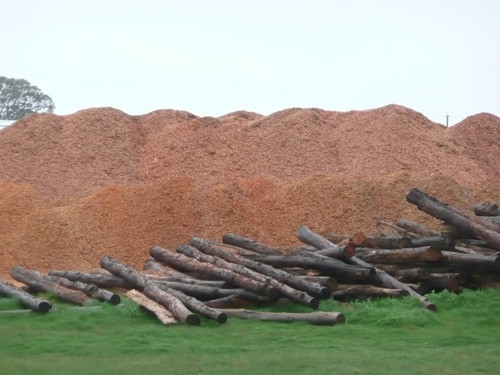 90% of this ‘forest residue’ is supplied to Murphy Fresh for chipping and use in their biofuel boiler (to grow hydroponic tomatoes). And if Murphy Fresh doesn’t want it, then it becomes a mountain of firewood for the people of Mansfield. Q. 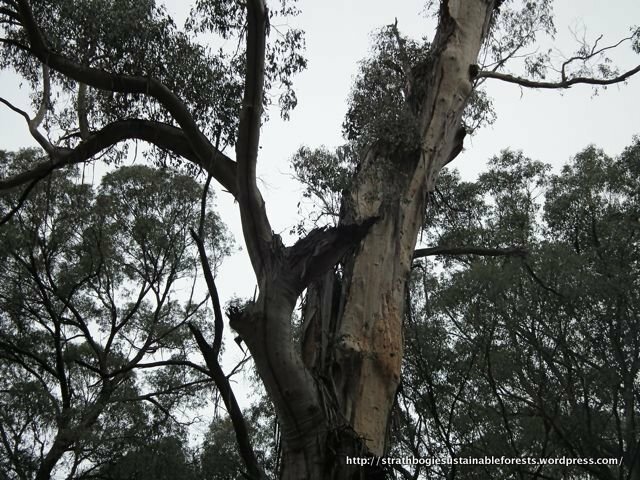 Why is VicForests logging this 35 yr old forest, rather than letting the trees mature and develop high quality timber? A. Apparently these fire-damaged trees will not produce good, future sawlogs. But why clear-fell the whole coupe? We can only assume that VicForests’ priority is to produce woodchips and firewood today and an even-aged stand of trees for future harvesting (pulp? sawlogs?). If you want to know how to turn a healthy, growing forest into hydroponic tomatoes – click a pic and read on. 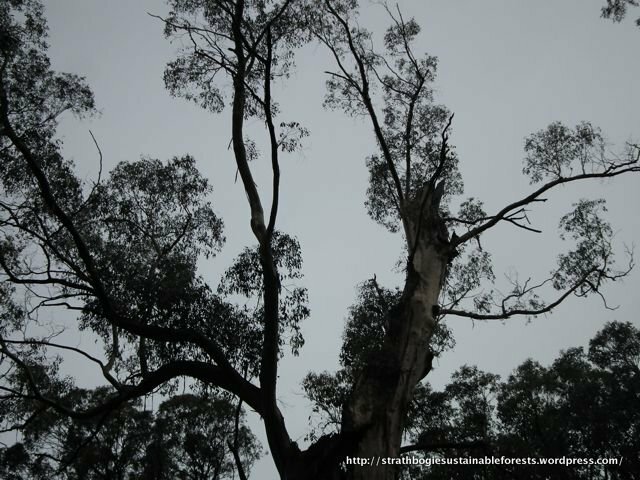 VicForests Tolmie coup (35 yr old) before logging; young, straight trees – hardly a sawlog in sight. The same VicForests Tolmie coupe after harvest. Look what’s left on the ground after logging has finished – all will be burnt! The contractor has finished – all to be burnt. Most of this ‘forest waste’ is headed to Murphy Fresh. Note the larger logs split to fit into the chipper. Most of the timber from the Tolmie coupe ends up here at Murphy Fresh. This pile of chips was once the young, healthy, though burnt, forest shown earlier! ‘Forest waste’ in the firewood contractor’s yard. Only about 10% of the coupe timber makes it to the firewood contractor’s yard. None of these will be sawlogs. Why not? What doesn’t end up being chipped and burnt to grow hydroponic tomatoes, ends up in these huge piles of firewood. You could be forgiven for thinking we live in a developing country – what’s happening at Tolmie, looks a little like forest practices in Indonesia. Do DEPI and Minister Peter Walsh, or even Minister Ryan Smith, know that VicForests is trashing valuable public assets simply to grow glasshouse tomatoes? Either way, yes or no, it’s a travesty and will turn once healthy, multi-age, biodiverse forests into tree farms. Here’s a stack of nice, straight logs at the Murphy Fresh glasshouse, ready for the biofuel chipper. Obviously forest waste!!! Here’s a short piece from our Mansfield correspondent, Doug Vance. Do Coles and Flavorite Tomatoes know how Murphy’s grow their tomatoes? Here are two photos of the previously burnt forest before it was logged, just to show how long and straight the trees were (in case it’s not obvious from the stacked logs). An absolute waste of valuable timber and a recovering forest! And an aerial pic of the stack pictured above. Another stack is being made next to this one. How much timber does the Murphy Fresh boiler need? Well, the boiler runs 365 days per year, we understand, and Murphy Fresh has an allocation of about 10,000 tonnes of native forest wood per year – no wonder they need a very big stack of logs. And all this timber is presumably green, they’re burning green wood! It may not be particularly efficient, but it’s cheap! 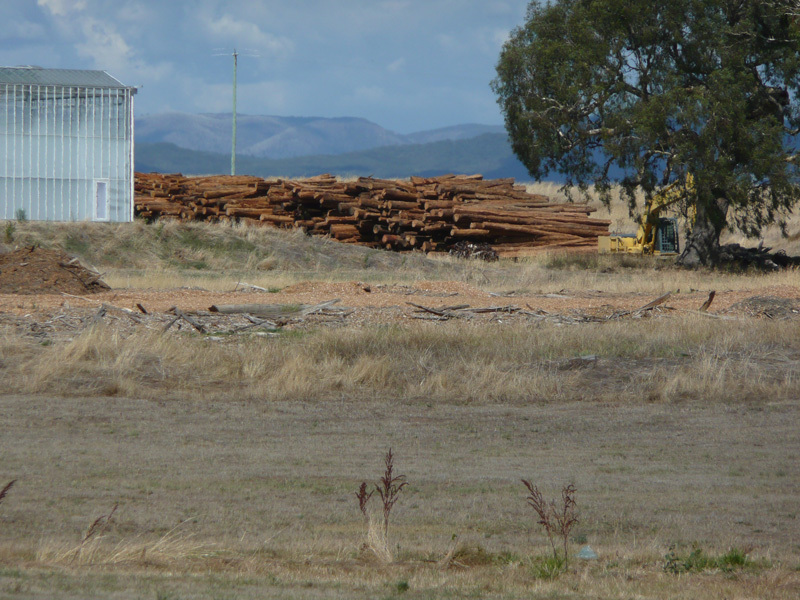 Cheap, because VicForests can supply the wood to Murphy’s at below-commercial cost. The invisible cost is borne by the forest and the catchment. The coupes where these trees were harvested will now slowly but surely be transformed into tree farms with 30 yr rotations – goodbye natural forest. 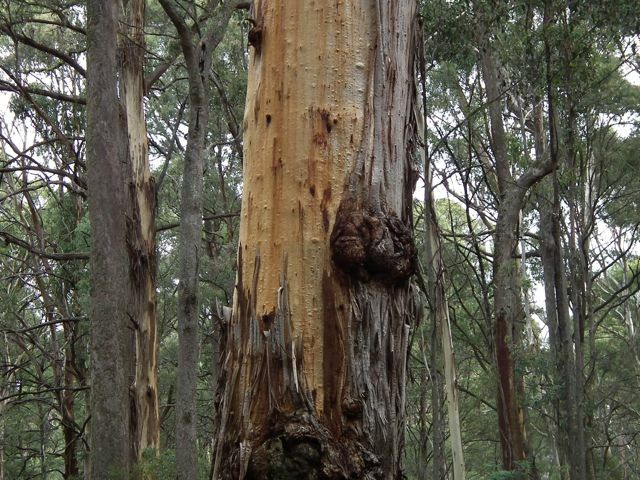 Going, going … giant Mountain Gums threatened. It’s not easy to convey, in pictures alone, the majesty of these forest giants. At 2.23 m diam. 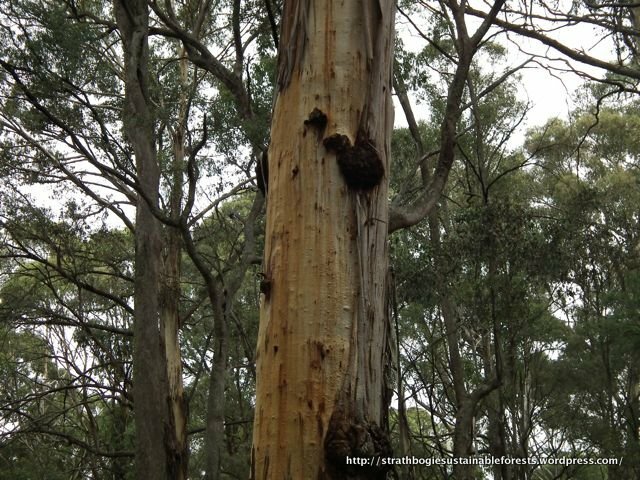 (at breast height), this Mountain Gum (Eucalyptus dalrympleana) is a Strathbogie veteran. 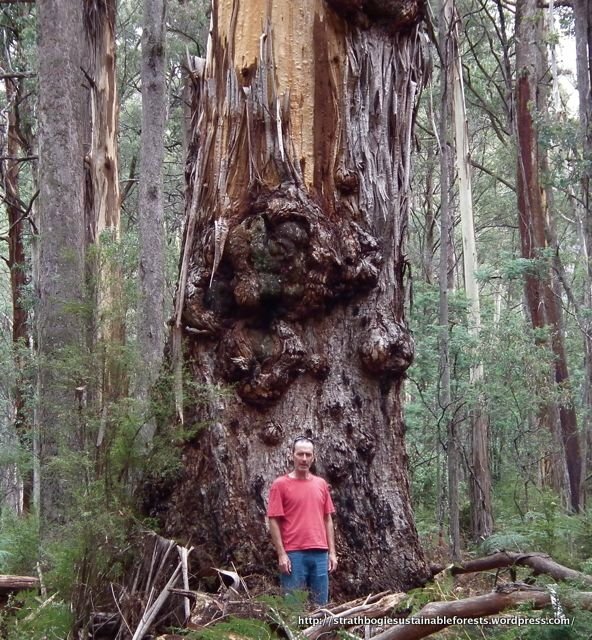 It’s undoubtedly survived numerous episodes of fire, drought, insect and fungus attack, as well as 100 years of selective logging, but may not see out the current VicForests logging cycle. It stands in one of the coupes scheduled for logging in the next few years and is likely to end up collateral damage. Its upper branches are 30+ m above ground, but the size of the broken trunk suggests it was once much taller. We invest heavily in the human history of this country, but it seems the stories of these forest elders don’t make the cut. Scroll to the bottom frame to get perspective on its size. It’s an easy tree to locate, being adjacent to Lima East Tk (AMG 0401470 E, 5917568 S). See if you can find a photo of a Mountain Gum of comparable size anywhere on Mr Google.